January 10th 2009, 14:48. 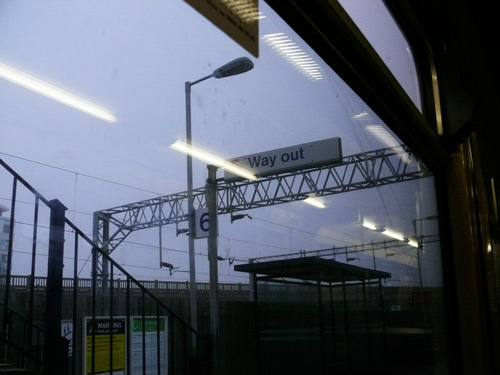 Bletchley, a once-better station – mainline now sidelined. Freezing, foggy day; light tilting gently back towards darkness. There and back again. The train leaves in 13 minutes and at the moment I am the only passenger. ‘Warning: have you paid?’ I have. ‘Keep feet off seats’. I am. Alone in the carriage, I wait for departure, to be transported. Why am I tense? I’m only going there and back again. 44 minutes each way. 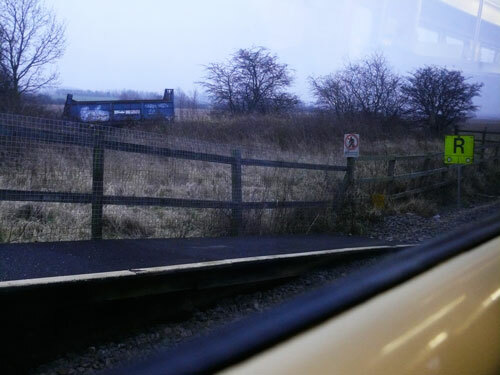 Branch line – how many years left now? Surviving this long, it must turn a profit. 14:59 two minutes to go. On the dot of 15:01, doors bleep, then close, and we ease off. We pass a poster: ‘in uncertain times seek out a virtuoso’. Cement works, scrapyards, ‘deals on wheels’. Fenny Stratford. Scene of Roman settlement. Over the Grand Union canal, frozen to icy stillness. Past wastescapes and junkspace, then quickly, fields. Bow Brickhill. Coloured things look grey in this light. A horse stands, majestic, still against the cold; breath pluming. “Horse walks into cinema”, a news story from the week. Not this one. “Horse in field” is no news to anyone. Skirting South Milton Keynes, houses round closes. Horses and houses, houses and horses. All horses seem to be at the corners of fields, where hedge abuts hedge, less cold perhaps? Woburn Sands. A finger of golf course touches the railway. Aspley Guise. I always confuse with Apsley, near Watford, much farther down the Grand Union. And so to Bedfordshire – told to children every night – under the M1. Ridgmont. Security fences in better repair here, valuable industry. Amazon.co.uk, the mothership landed here, books to everywhere, waiting to be transported; everything on the move. The partner train, working the same line, gushes past. Along the foot of an escarpment now, an unemployed football pitch, posts without nets. Lidlington. I once had a car-crash here, my car was a Cavalier, and so was I; always too eager to push on. The guard – “’ello there mate” – checks my ticket, then leaves to check the few others. A draft of aftershave, pulled in his wake, as he walks back again. Alongside a road; something satisfying when train speed matches car speed; present perfect. Millbrook. A toy bi-plane sits in a small field. Banksy inspired mice on a junction box. Stewartby. Big-bricked factories with bricked-up windows then tall brick chimneys; earth made brick, the base unit of building. Everywhere is brick; neatly stacked in piles, but most attractive in large mounds. A small, lonely tree in a huge field, never cut down, I wonder why. No profit to turn there; and for no Royal Oak. Kempston Hardwick. Graffiti: ‘superbad’. Masts and aerials at the edge of town. ‘Dreams: customer collections’. Parked cars in lots. Always cars, or bits of cars, on the edge of town. A football pitch, unplayed upon, goals with nets; oh to score in that goal! A grand old empty signal box – what’s left to signal? Bedford St Johns. 4 passengers get on, the first since we left. The back-sides of road-facing hoardings face us, messaging the people that matter. Over the Great Ouse, more than a match for the Grand Union. Welcome to Bedford. 15:40. 16:37: Bedford. Almost dark now, this train a single carriage. 5 passengers. Conversation spills over from two girls four seats in front of me: “he messed up”. We ease off, again, slowly, out of Bedford. “I want to be number one” – some kind of game? Bedford St Johns. It’s a phone conversation for one of them. The other sits and watches. “Are you alright? [a pause] I will, I will”. The call is over “sorry about that”. Rooms, lighted, but not yet curtained, stand out in the darkness. Lit up conversation at the backs of warehouses. Conversation inside: “15 minutes”, “15 minutes? Oh my God, just tell him straight up”. Kempston Hardwick. The conductor whistles a tune, nervously. Countryside now, streetlamps distant. The black chimney stacks loom against blue-black sky. Stewartby. Threatening this time, a murder scene round every corner. I put on my headphones: “…in the middle of the night, trying to find me…” Am I at a junction? Which track do I follow? “… I never thought it would happen, with me and the girl from Clapham…” Lidlington. Two people get off. Ridgmont. The other train – a capsule of yellowish light – flashes past. A well-lit level crossing; a David Lynch crime scene waiting for action. Aspley Guise. Woburn Sands. One of the girls gets off: “see you Monday” she says, smiling. The other sits quiet now, changed, aware again of what’s around her. Talking on her mobile: “yeah [pause] no [pause] bye”. Parents coming to pick her up? Guardians. Horses dimly lit, stabled for the night. Bow Brickhill. She gets off. Back over the frozen Grand Union, barges in darkness, too cold to sleep. Fenny Stratford. “…There was a time when you let me know, what’s really going on below…” Hallelujah, the song of the moment. Lighted, empty offices as Bletchley hoves into view. Our platform, lit by a sodium glow. Me, the only passenger to alight at 17:24.